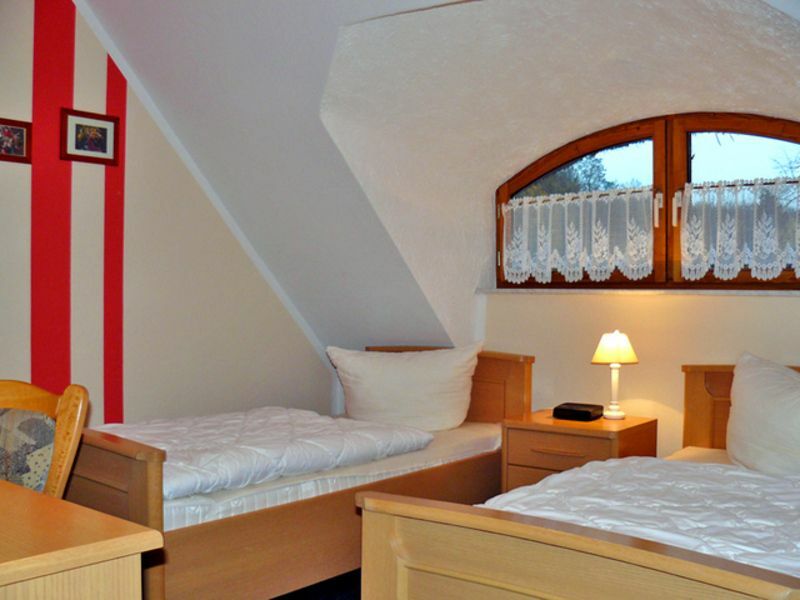 The double room is located on the upper floor of the thatched cottage and is about 23m ². It has two single beds (90x200), radio and shower with toilet. In this double room an extra bed (extra bed) is possible. There is no TV in the room! The family-run guesthouse is located in Niederhof, a district of Brandshagen - just 500 meters from the natural swimming area. The family-friendly guesthouse has 4 double rooms, 1 triple room and 1 quadruple room in the thatched-roof house. We offer our guests freshly prepared food - whether breakfast or our homemade cakes and pies. In bad weather (of course, also in good weather) can be tinkered in the pension to your heart's content: Teddies sew, pottery, painting porcelain, learn napkin techniques and much more. Many tourists associate the stay with the fact that in the evening a course is carried out. Herbal walks are also offered. Or you go to the in-house sauna. No one is bored here, even if there is no TV - because you search in vain in our accommodations. Only in the common room there is a TV. In our shop café you have the opportunity to buy self-made teddy bears and many offers of regional craftsmen. This family-run guesthouse is located in Niederhof near Brandshagen, a district of Sundhagen - just 500 meters from the natural swimming area. The Hanseatic cities of Stralsund and Greifswald as well as the islands of Rügen and Usedom and the Darß peninsula are in the immediate vicinity.